The Village of Lindenhurst will be hosting a Walk-Bike-Explore Lindenhurst event as part of Mobility Week. 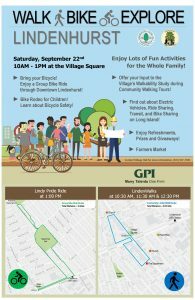 The event is part of the Village’s Walkability Study and will feature a “Lindy Pride Ride” bike ride (route can be found on the flyer) and a community “Lindenwalk,” (route also on flyer) where attendees can provide feedback to GPI, the engineering firm hired to do the Walkability Study. 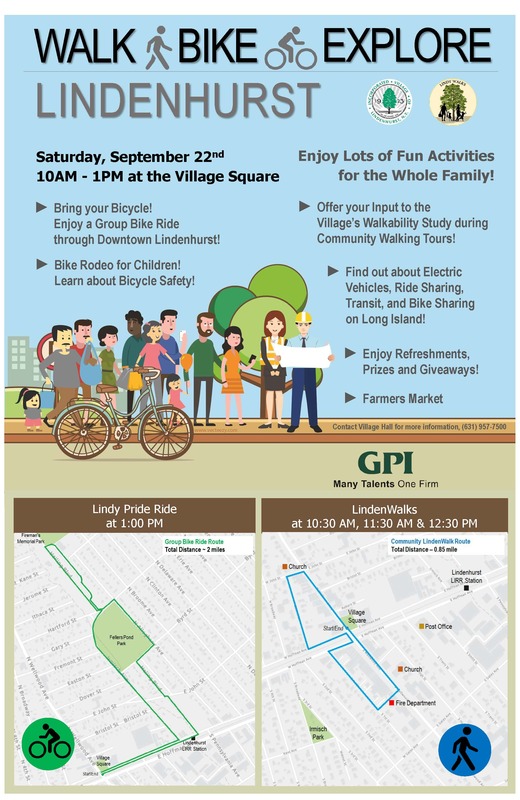 There will also be community groups, such as the Lindenhurst Cycling Club, that will provide a demonstration on bicycle safety to children and adults. Bring a bike to participate in the Lindy Pride Ride! Running concurrently with the event will be the Village and Chamber of Commerce’s revamped farmers market from 10:00 AM – 3:00 PM.